Our car was in an undercover car port and had become very dusty. OK, it needed a wash. It was driven a few kilometers down the road to meet a relative on Sunday the 9th September 2018, and just before hoping back in I noticed this very unusual circle pattern embedded in the dust on the roof and boot. No these are not scratches. The pattern did not appear on the glass or the front bonnet. To get a good photo of the pattern we parked the car in the sun near the carport, and I climbed a ladder onto the roof of the car port. Has anyone seen this type of phenomenon before? The car and carport has been used for years. It has been very dusty before and we have never noticed this before! The only explanation I can think of is an electromagnetic pulse of some sort. Do I need to get my tin foil hat out of storage? Looks like virga spotting to me. Virga, streaks of water drops or ice particles falling out of a cloud and evaporating before reaching the ground (distinguished from precipitation). Car looks like it was stopped at the time because of the streaks running down from the drop spots. Maybe splashed by a sprinkler as you drove by. A particularly forceful gust of wind carrying particulates? How tall is the carport ceiling, distance from the car roof? Trying to imagine a gust that whooshed up into the carport and bounced off the ceiling down onto the car. Have you checked the null school wind map for that time frame? That is a curious circular pattern, like you suggest as being possibly formed by some electrical pulse. I can't imagine a gust of wind causing that pattern. Where else was the car parked before you saw the pattern? (09-09-2018, 11:40 AM)piajensen Wrote: "like you suggest as being possibly formed by some electrical pulse"
It was a clear fine day, not a cloud in the sky at the time, and low humidity. It was definitely not sprinkler as Horse suggested, plus no rain about. It is not the water drops I am looking at. What I am looking at in these photos is the very fine lines of dust that look like scratches that have formed multiple concentric circles radiating out from the center of the roof of the car. 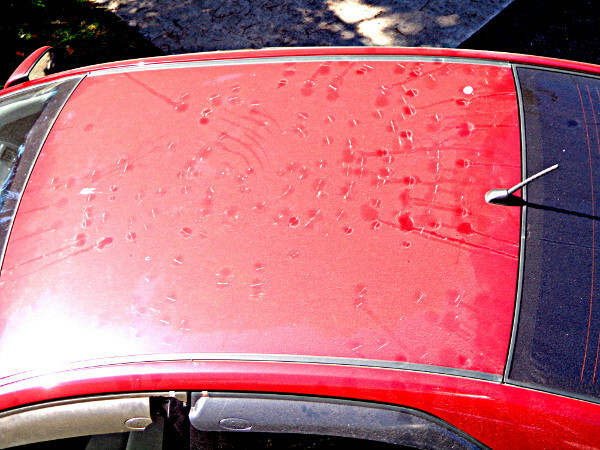 The second image of the car roof using enhanced contrast clearly shows the phenomenon. 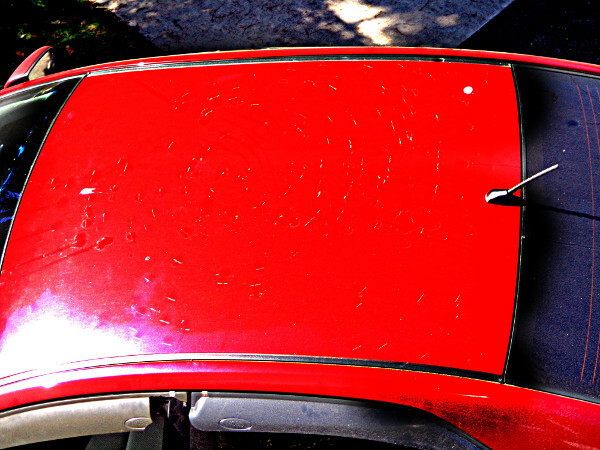 The very fine dust on the car roof has been pulled together to form multiple very fine and slightly curved lines forming concentric circles. This formation was not displaced even after the car was driven around. So it is unlikely a wind event created this formation. I was looking for a natural cause because I don't know what kind of electric field or electrostatic force could be involved in making the pattern in the dust. vital1: I recall there was a heat signature detected above Japan before the 311 earthquake & tsunami. Do you have the resources to discover either heat signatures or electromagnetic pulse events? I'm thinking that your observation is in line with EMP events. So, were there any disturbances with your electronics at the time of the event (hours not specifically known) ... faults in your auto's electrical, faults at home, faults wherever else your auto was during that period? (09-11-2018, 04:25 PM)piajensen Wrote: So, were there any disturbances with your electronics at the time of the event (hours not specifically known) ... faults in your auto's electrical, faults at home, faults wherever else your auto was during that period? Everything electrical here has been working fine during that time. 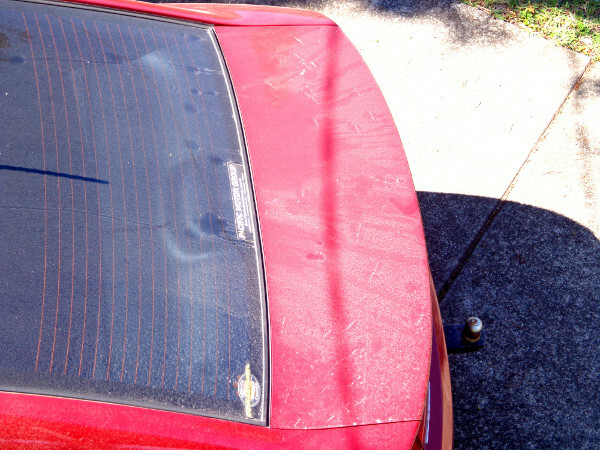 The other day the wind blew in a very fine light gray dust that coated my car. The dust wasn't uniform, I saw the same sort of blotching in places as in your pictures. It looked like it was caused by the wind turbulence from driving around. I didn't see a circular pattern but I didn't look on the roof. The dust wasn't the usual reddish color we often get and it was very fine, like a powder. It blew away just from more driving around. I think the granularity and size of the dust particles might have something to do with the circular pattern you show in your pictures.